GREECE / IONIAN / CORFU / GLYFADA / GLYFADA MENIGOS RESORT VILLA - APARTS. This complex of Glyfada beach Menigos resort villas and apartments is located in the region of Glyfada beach on the middle and west coast of Corfu and at a distance of 16 km from the town and airport of Corfu and exactly on the wonderful Glyfada Beach. The complex features parking space, swimmingpool 55qm, beach volleyball and tennis courts, TV lounge, car rental and transfer services. All units include bath, refrigerator, fully equipped kitchen, sitting area, living room, Sat-Tv and full airconditioning, balcony with amazing seaview, some of them on request internet ISDN connection and private garden with sun beds and umbrellas. 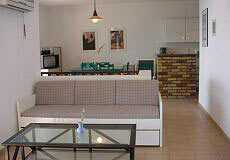 Facilities for vacation rental Glyfada Menigos Resort Villas-Apts. House type A1 (100 sqm), with 3 sleeping rooms, 2xWC/shower, living room-kitchen with SAT-TV, air-condition only in the living-room, washing - machine and balcony with panorama sea and beach view. Capacity for 2-6 persons. House type AB3G (simple furnished 45qm), front beach one floor house, very quiet with one double bed room, living room-kitchen (with 4 electro plates + oven, refrigerator) with 1-2 extra sofa bed, air-conditioning, Sat-TV, WC/bath, big Veranda and big garden with 2 sun beds and sea view. Capacity for 2-4 persons. House type A4G (60qm, second houseline 2 level bungalow with garden, 2 balconies and sea view), with 1doublebedroom, corridor with 2floors beds, 1 WC/bath and balcony with sea and beach view upstairs, living room - kitchen, Sat-TV downstairs, full air-conditioning, also a second balcony and garden with sun beds is available downstairs. Capacity for 2-6 persons. House type AB4G ( simple furnished 52qm), front beach apartment with a big garden and sea view) with 1 double bed room, a small children-room with just 2 single small beds, living room-kitchen with big refrigerator, 4 electro plates+oven, microwave , SAT-TV, WC/shower, big veranda and garden with 2 sun beds and nice sea view. Capacity 2-5 persons. Apartments type A5 (32-35qm), with 1 bedroom, living room with small kitchen equipped with 2 electro-plates, small refrigerator and coffee-machine, a Sofa bed in the living room, WC/shower, air-condition, Sat-TV and balcony with nice sea view. Capacity for 2-4 persons. Apartments type AA5 (renovated or new built apt. 32- 35qm), with 1 bedroom, living room with small kitchen equipped with 2 electro-plates, small refrigerator and coffee-machine, a Sofa bed in the living room, WC/shower, air-condition, Sat-TV and balcony with nice sea view. Capacity for 2-4 persons. Apartments type AA5G (new renovated apt. 40qm ), on the second houseline ca. 80m from the beach new renovated apt. with share garden and sun-beds, consists of 1double-bedroom, living room with 2 extra wood-beds, small kitchen equipped with 2 electro-plates, oven, big refrigerator and coffee-machine, new WC/shower, air-condition in both rooms, Sat-TV and balcony with very nice sea view, shared BBQ and garden with one more apartment. Capacity for 2-4 persons. House type A2 (70qm), with 2 bedrooms, 2 x balconies with nice sea and beach view, living room - kitchen with 4 electro-plates + oven, big refrigerator, a sofa bed for 1-2 persons, SAT-TV, 1 WC/shower, 2 x air-condition. Capacity for 4-6 persons (4 adults + 2 children). House type AG3G (new built house - 3 roomsapartment, sleeps up to 5 persons), at the third house row, consists of one main doublebedroom, a 2 singlebeds room with a small childroom with one bed unter the roof, livingroom-kitchen, Washmashine, dishwaser, WC/shower, 2 balconies with nice seaview, a lot of verandas and garden with seaview. House type AA2, 2 level bungalow (80qm), new renovated 2 level bungalow with 2 bedrooms, WC/bathroom, balcony with very nice sea view upstairs and living room -kitchen, second WC/shower, balcony downstairs, full air-conditioning, wash machine, coffee-machine and microwave. House type AA2G, 2 level bungalow with garden and sun-beds (80qm), new renovate 2 level bungalow with 2 bedrooms, WC/bathroom, balcony with very nice sea-view upstairs and living-room-kitchen, full air-conditioning, wash-machine, dishwasher, microwave, coffee-machine, second WC/shower, and balcony downstairs, also veranda and garden with sun beds nice sea view and a big umbrella incl.. Capacity for 2-6 persons. Front beach villa type AA3G ( 58qm with steam sauna, 60 jets Jacuzzi and very nice garden), higher class one level villa apartment, in wonderful place quiet and with big verandas and garden, comfortable woodbeds, garden-Jacuzzi with 60 jets, BBQ corner, just direct on the wonderful sandy beach of Glyfada. With a fantastic romantic sea view, it is situated on the right side of the Menigos resort direct on the sand and consists of: One double-bedroom, one small children room with one 2-floorbeds (bunk bed), a small corner office with internet Access ISDN, 1x WC/shower, 1x WC/steam-sauna, new modern kitchen - full equipped and comfortable living-room, full air-conditioning, ISDN/ADSL Tel., SAT- Flat TV, DVD- CD-player, wash-machine, dishwasher, microwave, cafe machine etc. The Villa is totally renovated. Capacity for 2-5 persons. 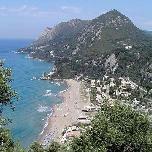 Shopping, restaurant, bar, INTERNET CAFE, super market, swimming-pool for children in about 40 -200 meters away. Rent a car from 19 Euro a day incl. full insurance and free km. Είστε ιδιοκτήτης ή διευθυντής στο GLYFADA MENIGOS RESORT VILLA - APARTS. ; Εγγραφείτε τώρα για δωρεάν εργαλεία, που μπορείτε να χρησιμοποιήσετε για να βελτιώσετε την καταχώρησή σας και να συνδέσετε την ιστοσελίδα σας και το σύστημα κρατήσεών σας.